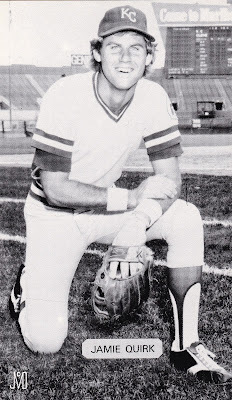 Career utility man Jamie Quirk played for 18 years in several uniforms, including multiple tours with Kansas City. From 1985 through 1988, in fact, he signed four straight one-year deals with the Royals, following brief stints with St. Louis, Chicago, and Cleveland. He reached the World Series with Oakland in 1990 and retired as an Athletic after 1992. While I didn't follow Quirk during his active career, I love his dedication to the game and ability to play wherever teams needed him. Best known as a catcher, Jamie played almost 25% of his games at other positions, and did everything but pitch. Most of my remaining wantlist consists of team issues and postcards.